I love quality free software and try to write about the all the good ones I come across here. But, it’s a lot of work when you are configuring a new computer either for yourself after a OS re-install or for a friend when you are ‘fixing it’. Earlier, I came across a project OpenDisc where they bundled a bunch of open-source free software and made it available as a downloadable cd. That did solve the problem of going out to individual sites to download the software I wanted. Ninite Volery (recently renamed) by Secure by Design Inc. has an awesome new service that makes it even easier. It is in private beta at the moment. It is open for public now. 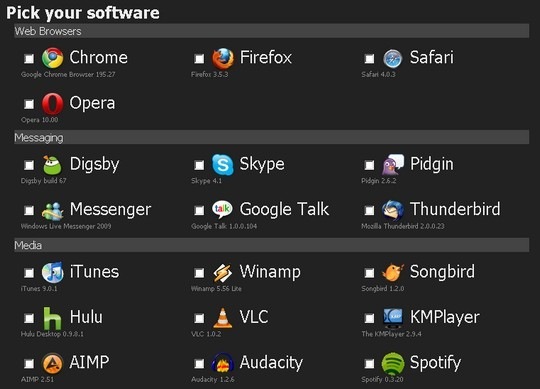 Ninite makes installing a load of free but quality software a piece of cake. In fact, the selection list amazed me as it had pretty much all the software i usually recommend to my friends listed. I am looking forward to trying out this service. I just used when during my Windows XP to Windows 7 upgrade and had to re-install Windows 7 twice due to an issue. Guess what helped me the most? Ninite! I could re-install 15 programs in one shot and just loved it! What do you think of this service? Wow! Let me say it again: Wow! This is something I will sure install first when doing a fresh install of windows (which I tend to do too often, lol). Enough with downloading software from every single site, and now I will actually get to install all the software in one go and I won’t miss any (which I also tend to do). Thanks once again! .-= Martey´s last blog ..Pregnant and headache =-.